This article is the second of a three-part series. Part I: What is caffeine? So you’ve decided you like tea, but you really don’t want (or can’t have) the caffeine. What are your alternatives? Well, first there’s decaf tea. As Part I of this series explained, decaffeination processes don’t remove 100% of the caffeine, so this is a reasonable alternative if you want less caffeine, but not if you want none at all. There’s another problem with switching to decaf: the selection of high-quality decaffeinated tea is — let’s just say, limited. It’s easy to find a decaf Earl Grey or a decaf version of your basic Lipton-in-a-bag. But if your tastes run more to sheng pu-erh, sencha, dragonwell, lapsang souchong, silver needle, Iron Goddess of Mercy, or organic first-flush Darjeeling, you have a problem. You can try the “wash” home-decaffeination method, but I explained a couple of days ago why that process is overrated. You’re likely to be able to remove 20% or so of the caffeine that way, but that’s about it. Another alternative is simply to brew weaker tea and/or use more infusions. Let’s do the math for an example. Assume you’re a big fan of an oolong that contains 80 mg of caffeine in a tablespoon of leaves, and you drink four cups of tea per day. If you use a fresh tablespoon of leaves for each cup, and you steep it for three minutes, you will be extracting about 42% of the caffeine in each cup, which equals 34 mg per cup, or a total of 136 mg of caffeine for the day. If you shorten your steep time to two minutes, the extraction level drops to about 33% (total of 106 mg). Alternatively, you could use the leaves twice each time, so you’re extracting about 63% of the caffeine, but using a total of half as many leaves (total of 101 mg). Or, if you don’t mind significantly weaker tea, just use 1-1/2 teaspoons of leaves instead of a full tablespoon. Half the leaves means half the caffeine (total of 68 mg). If you look through the selection of teas in a health-food store, you’ll notice that most of them have no tea at all, and the vast majority of those non-tea drinks have no caffeine. The problem is that chamomile for a tea drinker is like Scotch to a wine drinker; it’s just not the same. There are a couple of beverages, however, that are somewhat similar to tea. Both come from South Africa and both are naturally caffeine-free. Rooibos is often called “red bush” in the United States because the way it’s usually prepared leaves a deep red infusion. Typically, rooibos is oxidized (not fermented) like a black tea. It can also be prepared more like a green tea. I blogged about green rooibos last August if you’d like to know more about it. North American news shows, along with people like Oprah and Dr. Oz, have been singing the praises of rooibos lately, bringing it more into the mainstream awareness. It is very high in antioxidants and much lower in tannins than a black tea. Unfortunately, there isn’t a lot of independent research published about it yet, so many of the claims can’t really be backed up. The one that can be backed is that it has no caffeine and it tastes kind of like black tea (green rooibos is a bit grassy with malty undertones, more like a Japanese steamed green tea with a touch of black Assam). The honeybush plant has a number of distinct species. Pictured here is Cyclopia meyeriana. 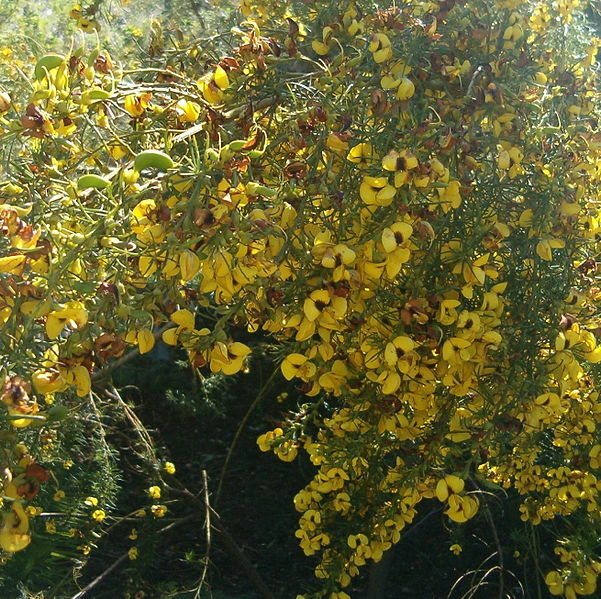 Honeybush, like rooibos, grows only in South Africa. 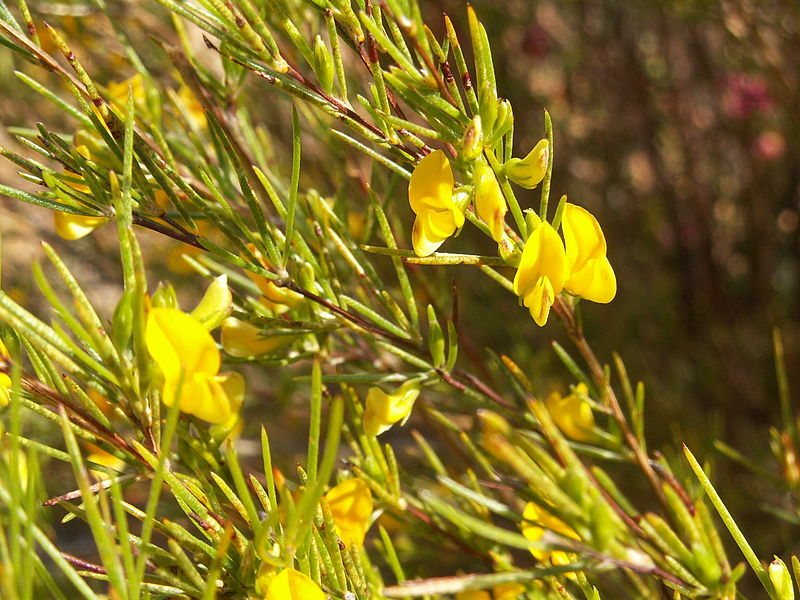 Also like rooibos, it is naturally caffeine-free and can be prepared either as a red or a green “tea.” When blooming, the flowers smell like honey, and honeybush tends to be somewhat sweeter than rooibos. Honeybush isn’t nearly as well-known as rooibos in the U.S., and the green version is very hard to find. I’ve found that if you want a flavored honeybush, citrus complements it very well. My “Hammer & Cremesickle Red” is the most popular honeybush blend in our tea bar (here is a blog post about it, and you can find it on the store website here). If you like the idea of reducing your caffeine intake, but you don’t like the idea of a weaker tea (as I described above) or switching to rooibos or honeybush, you might want to consider blending. If you mix your tea half-and-half with something containing no caffeine, then you can still brew a strong drink, but get only half the caffeine from it. Combine that with the other tricks, like taking two infusions, and you can cut it even farther. Posted on 5 July 2012, in Styles & Blends, Tea Thoughts and tagged antioxidants, Aspalathus linearis, caffeine, chamomile, Cyclopia meyeriana, decaffeination wash, honeybush, rooibos, tea. Bookmark the permalink. 7 Comments. I will nearly always choose a naturally caffeine-free herbal tea over a decaffeinated tea; even the best decaf teas still lack flavor. For another black-tea-like alternative, I also would point to red raspberry leaf, which is traditionally used medicinally for women during pregnancy, but is safe for anyone to consume at any time as a beverage. Good suggestion! And, of course, there’s no reason not to combine these alternatives. Rooibos and red raspberry leaves make a nice infusion together. Thanks for writing this, I very much appreciate it. I was a big coffee drinker, but I recently realized that the caffeine is ruining me. I have been trying to learn as much about teas, and especially low to no caffeine ones, as possible. You’re very welcome! There’s so much information — and misinformation — about caffeine that it’s hard to sort through all of it. I’m glad I could help. I discovered your tea blog and I am hooked! I’m a new convert to tea, having been a lifelong worshiper of coffee flavor and culture–but after spending way too much of my work morning reading your fascinating posts about the world of tea, I am not looking back! Thank you for writing and sharing about your experience in the tea world.